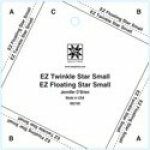 Small Twinkle Star Floating Star Ruler and pattern. Finished block: 5 inch. You can create 2 different style settings: Twinkle Star where the points touch, and Floating Star where the stars do not touch and float on the background. You will also get a bonus block that is made from scraps that you can use as a boarder or an additional quilt. Sew once and get 2 quilts.